Have you made a nomination yet? Has your Personal Tutor been amazing? Does your Programme Administrator have all the answers? Christ Church Students’ Union is offering students the chance to reward staff. Students from across the University are welcome to nominate any member of staff / team who play an influential role and have been particularly brilliant at what they do! This can be an academic member of staff, a member of support staff, or a support department team. So whether it is your tutor, administrator, or a receptionist; students can nominate staff by completing an online survey at www.ccsu.co.uk/goldenapple. Nominations close on Tue 7th May 2019. 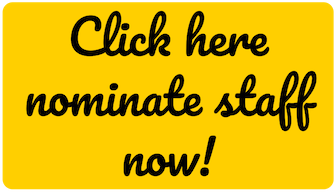 This is the 10th and final year the Golden Apple Awards will be taking place (in its current format), so nominate now before it's too late! Star in our Golden Apple Awards 2019 video! We are compiling a video of students talking about their nominated lecturers/ staff to play at the beginning of the ceremony. Once recorded, please email these to me at megan.cork@ccsu.co.uk or direct message them on Facebook to Facebook page @christchurchsu by Tuesday 7th May.